As my kids get more mobile and active I can’t help but to reflect on my own physical shape. And right now my shape is round. I can barely keep up with them now and things are really just taking off. I need to get into better condition. I am so out of shape now, the only thing I would consider starting with is walking. But whatever I do, I need to be prepared to integrate my kids into it or it simply isn’t going to happen. I immediately thought about jogger strollers as the perfect way to do some aggressive walking while keeping my kids involved. With a good jogger stroller I can keep my kids with me and actually get out there, and that’s 90% of it . . . just getting out the door with kids. Look at the great selection of double strollers at Morestrollers.com. They have everything and in all price ranges. 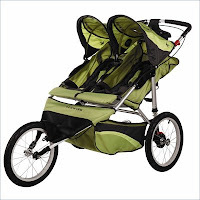 I particularly like the Schwinn Arrow Fixed Wheel Double Stroller, but this site has so many choices, I think there are probably a dozen more that would work for me. Hopefully, I’ll be out there soon zipping by in my rocker-sole shoes, twin jogging stroller, and a pile smiling crazy kids!